As a part of our Christmas celebrations, we sat down this past weekend to watch the Nativity Story as a family.The kids were really intrigued by the movie. They were so excited for the part where baby Jesus would be born. While we were watching, we were discussing the fact that babies don’t breathe air until they come out of their mommy’s tummy. Then they usually start crying. He didn’t realize it, but his comment was super profound! 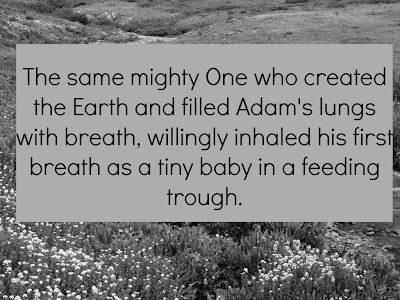 The same mighty One who created the Earth and filled Adam’s lungs with breath was now willingly inhaling his first breath as a tiny baby. *This is a repost from my old blog, A Steady Rain! I needed this reminder for myself during this busy season! I hope it encourages you! Ho Ho Ho! Merry Christmas! It’s that time of year where we’re surrounded by reindeer, magic snowmen, and elves! As families who want to emphasize the beauty of the advent, it can be hard to wade through the surface traditions that Christmastime brings. Instead of fighting against the mentions of Santa and his midnight delivery of toys to children around the globe, it might be helpful to find references to the gospel even in the familiar traditions of this season. It’s possible that even St. Nick can help us point our kids (and ourselves) to Christ! The truth is that we are ALL naughty! The fall in the Garden of Eden long ago sealed our fate as depraved, “bad” human beings and our position on the naughty list. Giving money to the Salvation Army bell ringers or showing up for a Christmas Eve service does nothing to move our names to the preferred nice list. In fact, even the most consistently “good” person can never measure up to God’s holy standard. (Romans 3:10). We don’t have to be left on that cursed naughty list though. Jesus Christ covered up his divine nature with our sinful flesh and lived perfectly for us. His record is now ours when we accept His work on our behalf meaning that when the Father sees us, we are no longer “naughty” but perfectly “nice”. Oh, we are Santa’s elves. We work hard all day…. In order to make enough toys for every boy and girl in the world, those elves have a ton of work to do! I’m sure magic helps a bit, but a lot of effort goes into the process! Jesus completed a task far greater than any Christmas toy as He hung on the cross for us. John 19:30 tells us that he breathed, “It is finished” as he bore the wrath of a holy God in His body. 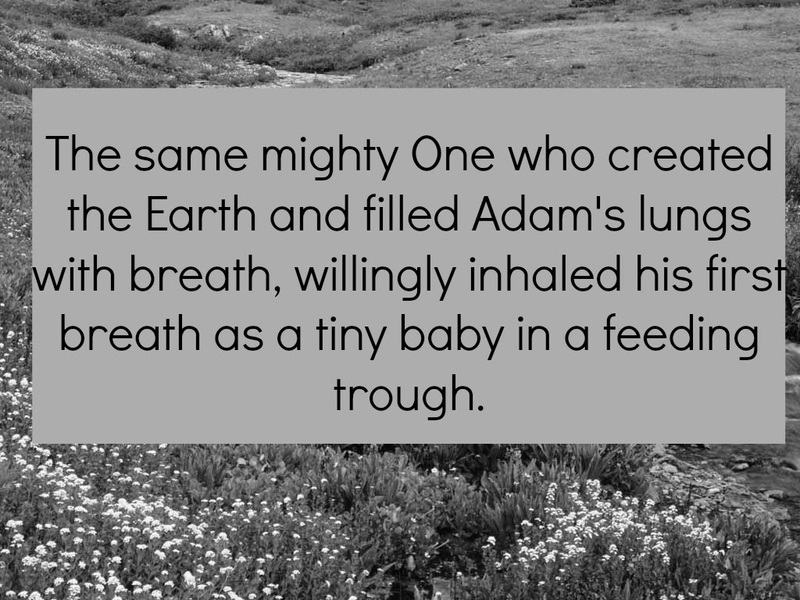 He would be separated from His Father because of our sin, not His. Any work we do would never come close to the effectiveness of His work on our behalf and is only done out of our gratefulness to Him. The work is done! Except for the rings, those gift ideas probably don’t appear on too many Christmas wish lists these days, but the desire for more “stuff” hasn’t disappeared. We spend hour shopping for the perfect present for each person in our family and look forward to early Christmas morning when we enjoy the surprised look on their faces! Unfortunately, even the most expensive of gifts won’t last forever. Toys will break (even as early as Christmas afternoon), cars will be dented, and jewelry will be misplaced. All is not lost, however! The gift of grace earned through Christ will never end. Through it, we receive abundant life which begins when receive it and comes to completeness in eternity! The gift of salvation will last forever! Enjoy this holiday season! Sing silly carols and make gingerbread houses with your family! Have fun choosing gifts for one another and finding the best place for mistletoe. But, let the joy of the holidays be fueled by the Prince of Peace whose coming provided eternal riches for your soul! Even the Grinch can’t take that away! Want more gospel encouragement in your inbox? Subscribe here for The Kitchen Table Newsletter and receive a brand new video series I created just for you!